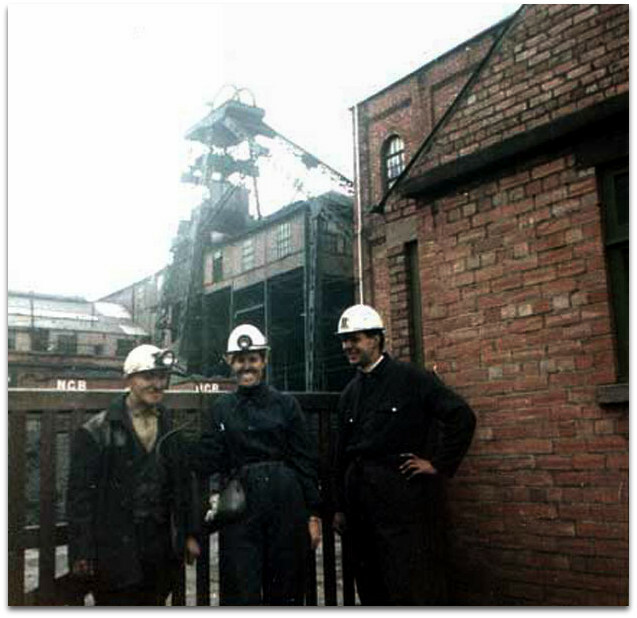 Outside Glebe Pit, Washington, County Durham in 1960s. Ian Ogilvie, Curate Washington Holy Trinity later Industrial Chaplain for Durham Diocese. I found the history of Mine Rescue interesting because my grandfather Jonas Todd was a member of the Rescue Brigade in Washington County Durham. My dad Sam Scorer became Ventilation Officer at the Glebe Pit so everyone who worked there would remember him. His brother Bob Scorer worked in the lamp cabin. My grandfather Jonas Todd was a Deputy at the Glebe Pit and went on to become an instructor working at Usworth. Mr. Favell, the coroner for North Durham, held an inquest on Monday afternoon at Washington-on-the-Wear, upon the bodies of the ten pitmen killed on Friday afternoon by being precipitated down the shaft at the colliery through the engineman having failed to stop the engine at the moment that the cage containing the unfortunate men reached the flat sheets at the mouth of the pit. The colliery is wrought in two seams the Hutton and the Maudlin. A longer rope is used for drawing out the men from the Hutton than the Maudlin. The deceased men were employed in the Maudlin seam, and had been detained below some hours after the men belonging to their shift had got to bank by a fall of coal in the pit, which had obliged them to go round by the waste. The men work in the Hutton seam in the night shift, and it seems that at the time that the men were being drawn out of the pit a locomotive was passing the engine-house, and Taylor, the engineman, stated at the inquest that in consequence of the locomotive passing at the moment the bell rang from the bottom of the pit to "set away," he took his sight from the pit mouth fixed it on the indicator in the engine-house, which shows when the cage is at bank. But upon this slide in the indicator there are two marks, one for the long rope, the other for the short one. The deceased men were travelling by the short one. But as the miners working in the Maudlin seams are generally out of the pit long before the time that the men were coming to bank, Taylor unfortunately fixed his eyes upon the mark used for the longer rope which fetches ten men to bank from the Hutton seam, which mark is nine inches above the day mark, and as nine inches on the slide represents 11 fathoms of rope, there was enough excess of rope to carry the cage up to the woodwork and cause the catastrophe. Two or three pitmen had been standing at bank when the cage, with the shouting and screaming men, flew past them ; but they said that they were "knocked blind" by the frightful spectacle, and could hardly give the alarm. The banksman had not been at his post at the pit mouth at the time of the accident. Taylor informed the coroner that he had nothing to say against the engine. The coroner summed up the evidence, tracing the accident to the winding up of the cage beyond the proper place, and asking whether Taylor, the breaksman, omitted to stop the engine through carelessness or by accident. The jurymen retired, and on returning into court, after an absence of about a quarter of an hour, gave a verdict of "Accidental Death," coupled with the recommendation that a signal should be given to the breaksman to prevent him drawing men from the pit until locomotive, were clear of the engine-house ; they also consulted Coulson, the banksman, censurable for leaving his work when the men were being drawn up the shaft. They trusted further that if anything could be devised to prevent such accidents occurring in future it would be done, and drew particular attention to the danger of mistaking the two letters B on the slide, referring to the long and short ropes, and suggested the covering up of one while the other was being used. Mr. Willis, the manager, said that the latter representation had been anticipated. The inquiry occupied between six and seven hours, and Taylor, who was in custody, would be brought before the Gateshead magistrates yesterday. Mr. Atkinson, the Government inspector of mines, was present at the inquest. I came across your site quite by chance. I purchased from Ebay the St John Ambulance medallions belonging to Jonas Todd, awarded in 1922 with 'labels' 1923 to 1961. The purchase included a bundle of badges and buttons, and a single medallion to Samual Scorer which I thought were unrelated. In researching the name Jonas Todd lo and behold I came across the post by Allan Scorer referring to Jonas Todd with a picture of Sam Scorer! I am sure this is the Sam Scorer whose medallion I have and who seems to be the son in law of Jonas Todd. I would love to contact Allan Scorer. Jonas Todd and Sam Scorer – The Story so Far! I have a particular interest in the first aid re-examination medallions of the St John Ambulance Association. The SJAA was the civilian teaching arm of the St John Ambulance movement. It was founded in 1877 and lasted until 1999 when its identity was finally lost in the re-organisation of the St John movement. I was its Assistant Director General and last member. 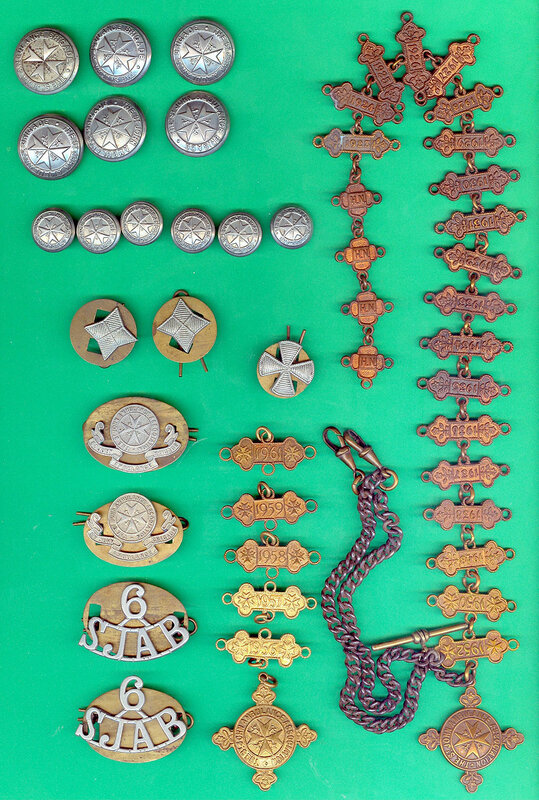 The small collection of apparently disparate St John Ambulance badges and buttons advertised on Ebay looked interesting enough to be worth a modest bid. It included 2 medallions, a number of attached and unattached labels and a complete Albert watch chain which tipped the balance! There were no names or numbers and no reason to think the items were connected. Mine was the only bid. 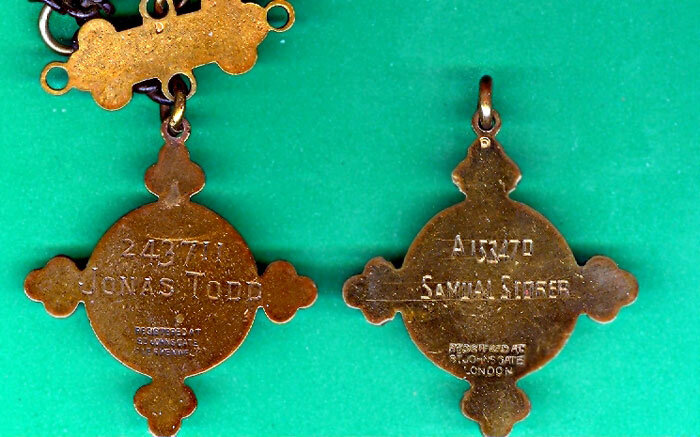 The medallions were for Jonas Todd 243711 with 19 labels 1923 to 1952 (consecutive to 1938) and Samual Scorer A153470. The medallions were issued in 1922 and 1952 respectively. 5 loose labels 1956-61 probably belong to Sam Scorer. It is rare to find a story behind medallions on Ebay – the usual answer to queries being that they came from a house clearance or car boot sale. For me it is the story that matters. The Ebay seller was 'superdeal 40' which Paypal showed to be Peter Tree with the email address above. I am not hopeful of finding the original of the medallions but Peter is copied in above! It was quickly apparent that Jonas Todd was a name especially linked to the mining industry in Durham, almost the origin of the St John Ambulance Association! The Durham Mining Museum (www.dmm2.org.uk/individ0/i03458.htm) included a page for Jonas Todd born 1837 who died in a mining accident in the Washington colliery on 1 June 1867 – he left a wife and 2 children. Next I found Fionn Taylor's mining website. To my very great surprise there was a page about Jonas Todd that showed a picture of Sam Scorer! The information was given by Allan Hylton Scorer, son of Sam Scorer and grandson of Jonas Todd, both of who worked in the Glebe Pit in Washington. This led me to Audrey Fletcher's Washington Lass site and the correspondence and pictures submitted by Allan Scorer (http://washingtonlass.com/GlebePit_SamScorer.html) about his father and grandfather. From here I was taken to Allan Scorer's Genealogy family tree pages (http://familytreemaker.genealogy.com/users/s/c/o/Allan-H-Scorer/index.html). Now the full story emerged! Allan Hylton Scorer (1941) was the son of Samual Scorer (1912-92) and Stella Todd (1914). Jonas Todd and Mary Gardner had 7 children. One of them was Jonas Todd born 1837, almost certainly the Jonas killed in the mining accident in 1867. Allan Scorer's family tree pages include a huge amount of information about his father and grandfather, whose medallions, badges and buttons I appear to have, and their St John Ambulance activities. If anyone can add to this material or can put me in touch with Allan Scorer I'd be delighted to hear from you! I and another relative are researching our family tree and wonder if your Jonas Todd who died in a pit accident is part of our family? A Robert H Todd, born 1837 Usworth, (Co Durham) married a Charlotte Glynn in 1868, Lewisham, London, They settled in South Shields but don’t seem to have lived together much. Charlotte Glynn committed bigamy marrying Robert H Todd as she already had a husband and three children living in Hackney. Robert H Todd and Charlotte had no children together. Both of them died in South Shields Workhouse, Charlotte in 1894 and Robert 1920. Robert’s Father is recorded as Jonas Todd and, it seems, had a twin Brother also named Jonas Todd born 1837 Usworth. When Robert H Todd ‘married’ Charlotte in November 1868, her youngest sibling Henry was given the surname Todd. Robert H Todd gave his Father’s name as Jonas Todd (deceased) on Wedding Certificate. Henry Glynn (Todd), born Hackney Workhouse in 1860, went on to marry my Grandmother living at South Shields.